RLSafeHome is helping keep seniors in the Seacoast area of NH, Southern Maine, and Northeastern Massachusetts in their homes longer with products that make aging at home safer and more secure. 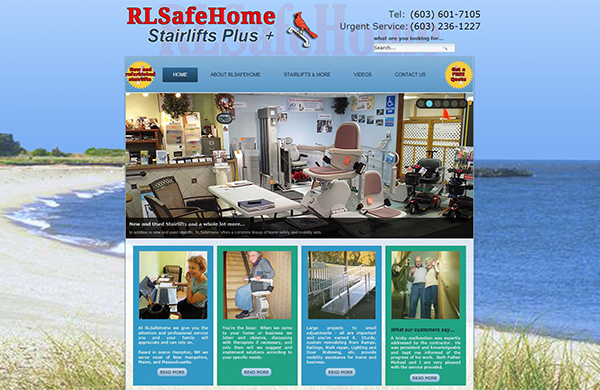 RLSafeHome's new website designed by PCS Web Design helps them to reach their target market in their preferred service areas with a mobile-friendly, CMS-enabled website that let's them tell the whole story with words, audio, and video content hosted directly on their website. 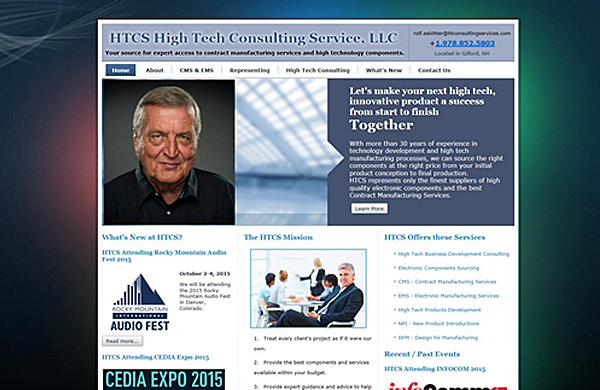 HTCS High Tech Consulting Service represents CMS (that's Contract Manufacturing Services) and high-technology component manufacturers and needed a CMS-enabled (as in Content Management System) website to reach its target market. With an active show schedule that's featured prominently on their homepage, potential clients can easily find out when and where they can meet and speak directly with the company's founder and president. Utilizing a responsive design that's mobile-friendly, potential clients searching for the company from their mobile devices can easily connect with them at show venues anywhere in the world. PCS Web Design loves working with creative individuals. 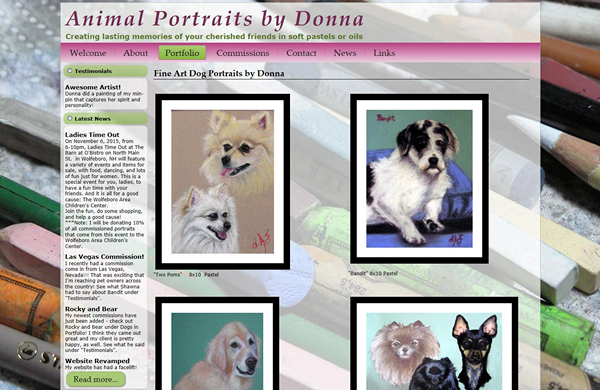 PCS' owner, Jim Fontaine, happens to be married to this professional animal portrait artist, so you could say this website was a labor of love! That being said, there's no doubt that this website showcases the artist's talent. Donna was very pleased with the results and the fact that commissions from other areas of the country began coming in almost immediately demonstrates the impact that a professionally designed website can have for any business. This basic business website for a local excavating contractor and licensed septic installer fit the bill perfectly. 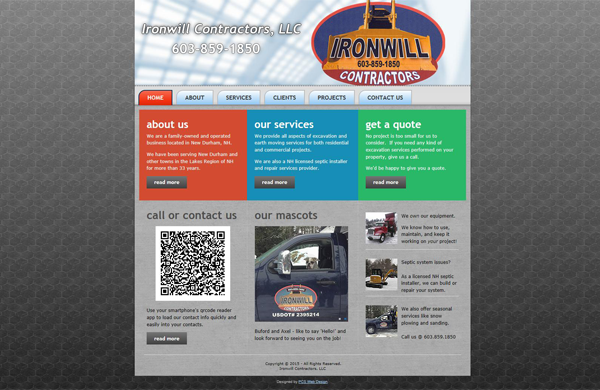 With a great reputation and a recognizable logo on their vehicles, job site signage, and frequent mailings it was easy to construct a website that maintained and expanded upon their name recognition by giving them a strong visual online presence. Subtle touches like photo shadows and adding the business' logo as watermarks to website photos gives this simple site a very polished appearance. Providing the companies complete contact info via a QR-code makes it easy for potential customers and other contractors to add this business to their mobile phone's contacts. 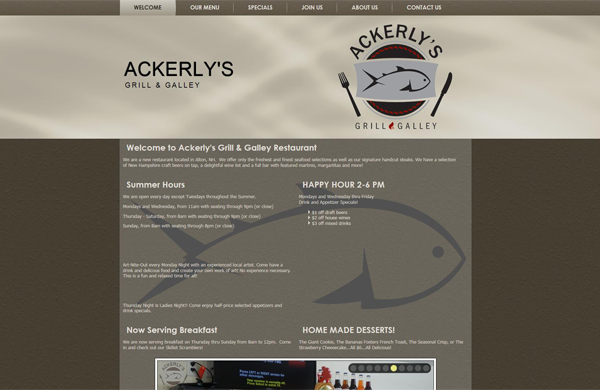 Ackerly's Grill and Galley Restaurant needed a website that could help introduce and spread the word about this new establishment that was located in a well-known restaurant location in Alton, NH. Integrating Facebook comments and the restaurant's Facebook Page directly into the website helped to quickly reach their dining patrons and let them tell others about the restaurant. Being CMS-enabled allows the owners to quickly update their menu whenever new items are added as well as feature specials and events hosted by the restaurant.